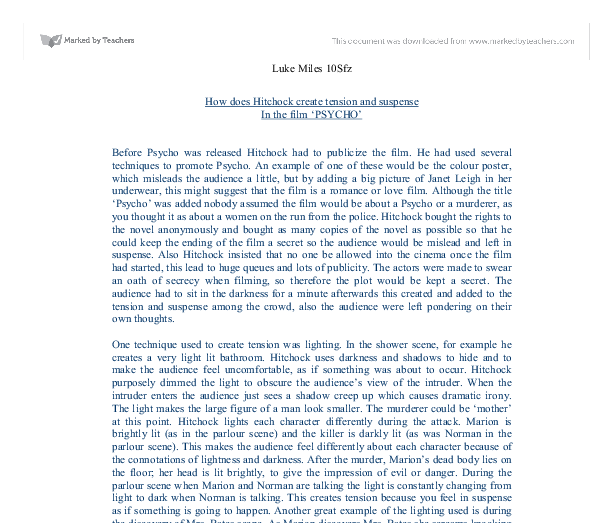 How does Hitchock create tension and suspenseIn the film 'Psycho'? How does Hitchock create tension and suspense In the film 'PSYCHO' Before Psycho was released Hitchock had to publicize the film. He had used several techniques to promote Psycho. An example of one of these would be the colour poster, which misleads the audience a little, but by adding a big picture of Janet Leigh in her underwear, this might suggest that the film is a romance or love film. Although the title 'Psycho' was added nobody assumed the film would be about a Psycho or a murderer, as you thought it as about a women on the run from the police. Hitchock bought the rights to the novel anonymously and bought as many copies of the novel as possible so that he could keep the ending of the film a secret so the audience would be mislead and left in suspense. Also Hitchock insisted that no one be allowed into the cinema once the film had started, this lead to huge queues and lots of publicity. ...read more. This swinging light bulb imitates the skeleton face as if it moving, it creates a sadistic smile that then creates suspense and tension. Hitchock also used music. An example of this is during the discovery of Mrs. Bates scene because the music is short sharp and this creates suspense and means that danger is probably on the way. This causes the audience to become extremely tense. This is quite similar throughout the film; for example, the violin is repeated to represent both stabbing and screaming. For example in the shower scene Marion is being murdered, this loud shrieking music is repeated in the discovery of Mrs. Bates scene and the second murder of Arbaghast. During the discovery of Mrs. Bates the tension is relieved then built up again by the use of music. The pace of the music gets faster and dramatic as Norman is running up to the house. Throughout the film the music is always there, string and bass play the deep, dark and evil music. ...read more. Finally, Hitchock also used dialogue to create tension and suspense. This can be seen in the parlour scene because he adds some very meaningful text, for example 'A boys best friend his mother' this suggests how strong his relationship with his mother could have been. Also Marion suggests putting mother in an institution. Norman reacts quite angrily and bites back. However his relationship with his mother wasn't all that good because there is a sense of jealousy when Norman says 'a son is a poor substitute for a lover' which may suggest why he killed his mother and her lover, the fact that he was jealous suggests he wanted his own back. When Norman bites back at Marion this creates an air of suspense as they weren't getting along. Therefore in conclusion I would say that Hitchock creates suspense and tension very well in the film 'Psycho'. He uses lighting, music, camera shots/angles, dialogue to a great effect. These techniques are also very effective in creating tension and suspense especially the lighting and music. Hitchock took the traditional ideas and made them fresh, new and exiting. Luke Miles 10Sfz ...read more. His face is also mostly in shadow. As Norman becomes more agitated, he leans forward, moving from right to left and filling the frame. His look is piercing. Then he reveals his own experience of the madhouse by saying such things as "cruel eyes studying you". During the entire scene Marion is in light. When we first see the murderer it comes up as a dark and creepy silhouette. Another scene, in which there is a vast amount of tension built up, is the killing of the detective, Arbogast. Arbogast is following up Marion Crane's disappearance. This indicates that he has had some bad encounters with the paw because one's face usually whitens when feeling sick, shocked or frightened. 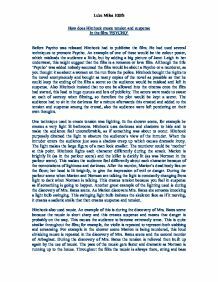 However, he does warn the White's about its powers, "it has caused enough mischief already", although he prevents himself from revealing the full details of these events for some reason. dislike Mrs Tweedy as well as that she is having Edwina killed. Low angled shots are taken from below an actor as if they are looking down on the audience, it makes them seem superior and the audience seem vulnerable. If Marion didn't choose to take the money then she wouldn't have died. The shot of the money then moves to the suitcase, and it is here we know that she is planning to run away. However, the close-up of the money moves to one of Marion's packed suitcase. He is the only person who can translate the ledger which holds all the information to bring down Capone; without the bookkeeper there would be no stopping Capone. The arrest of the bookkeeper should be fairly easy but Ness finds himself in with for reasons.